Escherichia coli YhbY is associated with pre-50S ribosomal subunits, which implies a function in ribosome assembly. GFP fused to a single-domain CRM protein from maize localises to the nucleolus, suggesting that an analogous activity may have been retained in plants (PUBMED:17105995). A CRM domain containing protein in plant chloroplasts has been shown to function in group I and II intron splicing (PUBMED:18065687). In vitro experiments with an isolated maize CRM domain have shown it to have RNA binding activity. These and other results suggest that the CRM domain evolved in the context of ribosome function prior to the divergence of Archaea and Bacteria, that this function has been maintained in extant prokaryotes, and that the domain was recruited to serve as an RNA binding module during the evolution of plant genomes (PUBMED:17105995). 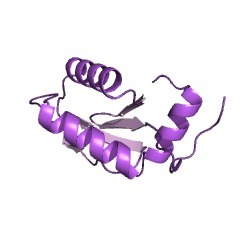 YhbY has a fold similar to that of the C-terminal domain of translation initiation factor 3 (IF3C), which binds to 16S rRNA in the 30S ribosome (PUBMED:12429100). The CRM domain is an ~100-amino acid RNA-binding domain. The name chloroplast RNA splicing and ribosome maturation (CRM) has been suggested to reflect the functions established for the four characterised members of the family: Zea mays (Maize) CRS1 (Q9FYT6), CAF1 (Q84N49) and CAF2 (Q84N48) proteins and the Escherichia coli protein YhbY (P0AGK4). The CRM domain is found in eubacteria, archaea, and plants. The CRM domain is represented as a stand-alone protein in archaea and bacteria, and in single- and multi-domain proteins in plants. It has been suggested that prokaryotic CRM proteins existed as ribosome-associated proteins prior to the divergence of archaea and bacteria, and that they were co-opted in the plant lineage as RNA binding modules by incorporation into diverse protein contexts. Plant CRM domains are predicted to reside not only in the chloroplast, but also in the mitochondrion and the nucleo/cytoplasmic compartment. The diversity of the CRM domain family in plants suggests a diverse set of RNA targets [(PUBMED:12881426), (PUBMED:17105995)]. The CRM domain is a compact alpha/beta domain consisting of a four-stranded beta sheet and three alpha helices with an alpha-beta-alpha-beta-alpha-beta-beta topology. The beta sheet face is basic, consistent with a role in RNA binding. Proximal to the basic beta sheet face is another moiety that could contribute to nucleic acid recognition. Connecting strand beta1 and helix alpha2 is a loop with a six amino acid motif, GxxG flanked by large aliphatic residues, within which one 'x' is typically a basic residue [(PUBMED:12429100)]. Escherichia coli YhbY is associated with pre-50S ribosomal subunits, which implies a function in ribosome assembly. GFP fused to a single-domain CRM protein from maize localises to the nucleolus, suggesting that an analogous activity may have been retained in plants [(PUBMED:17105995)]. A CRM domain containing protein in plant chloroplasts has been shown to function in group I and II intron splicing [(PUBMED:18065687)]. In vitro experiments with an isolated maize CRM domain have shown it to have RNA binding activity. These and other results suggest that the CRM domain evolved in the context of ribosome function prior to the divergence of Archaea and Bacteria, that this function has been maintained in extant prokaryotes, and that the domain was recruited to serve as an RNA binding module during the evolution of plant genomes [(PUBMED:17105995)]. YhbY has a fold similar to that of the C-terminal domain of translation initiation factor 3 (IF3C), which binds to 16S rRNA in the 30S ribosome [(PUBMED:11565746)]. There are 11640 CRS1_YhbY domains in 9427 proteins in SMART's nrdb database. Taxonomic distribution of proteins containing CRS1_YhbY domain. This tree includes only several representative species. The complete taxonomic breakdown of all proteins with CRS1_YhbY domain is also avaliable. Click on the protein counts, or double click on taxonomic names to display all proteins containing CRS1_YhbY domain in the selected taxonomic class. A CRM domain protein functions dually in group I and group II intronsplicing in land plant chloroplasts. The CRM domain is a recently recognized RNA binding domain found in threegroup II intron splicing factors in chloroplasts, in a bacterial proteinthat associates with ribosome precursors, and in a family ofuncharacterized proteins in plants. To elucidate the functional repertoireof proteins with CRM domains, we studied CFM2 (for CRM Family Member 2),which harbors four CRM domains. RNA coimmunoprecipitation assays showedthat CFM2 in maize (Zea mays) chloroplasts is associated with the group Iintron in pre-trnL-UAA and group II introns in the ndhA and ycf3pre-mRNAs. T-DNA insertions in the Arabidopsis thaliana ortholog conditiona defective-seed phenotype (strong allele) or chlorophyll-deficientseedlings with impaired splicing of the trnL group I intron and the ndhA,ycf3-int1, and clpP-int2 group II introns (weak alleles). CFM2 and twopreviously described CRM proteins are bound simultaneously to the ndhA andycf3-int1 introns and act in a nonredundant fashion to promote theirsplicing. With these findings, CRM domain proteins are implicated in theactivities of three classes of catalytic RNA: group I introns, group IIintrons, and 23S rRNA. The CRM domain: an RNA binding module derived from an ancientribosome-associated protein. The CRS1-YhbY domain (also called the CRM domain) is represented as astand-alone protein in Archaea and Bacteria, and in a family of single-and multidomain proteins in plants. The function of this domain isunknown, but structural data and the presence of the domain in severalproteins known to interact with RNA have led to the proposal that it bindsRNA. Here we describe a phylogenetic analysis of the domain, itsincorporation into diverse proteins in plants, and biochemical propertiesof a prokaryotic and eukaryotic representative of the domain family. Weshow that a bacterial member of the family, Escherichia coli YhbY, isassociated with pre-50S ribosomal subunits, suggesting that YhbY functionsin ribosome assembly. GFP fused to a single-domain CRM protein from maizelocalizes to the nucleolus, suggesting that an analogous activity may havebeen retained in plants. We show further that an isolated maize CRM domainhas RNA binding activity in vitro, and that a small motif shared with KHRNA binding domains, a conserved "GxxG" loop, contributes to its RNAbinding activity. These and other results suggest that the CRM domainevolved in the context of ribosome function prior to the divergence ofArchaea and Bacteria, that this function has been maintained in extantprokaryotes, and that the domain was recruited to serve as an RNA bindingmodule during the evolution of plant genomes. 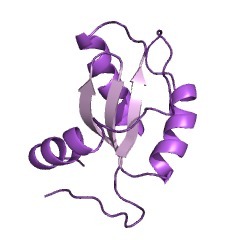 Crystal structure of E. coli YhbY: a representative of a novel class ofRNA binding proteins. 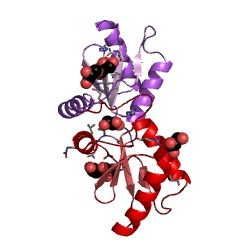 E. coli YhbY belongs to a conserved family of hypothetical proteinsrepresented in eubacteria, archaea, and plants (Pfam code UPF0044). Threemaize proteins harboring UPF0044-like domains are required for chloroplastgroup II intron splicing, and bioinformatic data suggest a role forprokaryotic UPF0044 members in translation. The crystal structure of YhbYhas been determined. YhbY has a fold similar to that of the C-terminaldomain of translation initiation factor 3 (IF3C), which binds to 16S rRNAin the 30S ribosome. Modeling studies indicate that the same surface ishighly basic in all members of UPF0044, suggesting a conserved RNA bindingsurface. Taken together, the evidence suggests that members of UPF0044constitute a previously unrecognized class of RNA binding domain. Structure of HI1333 (YhbY), a putative RNA-binding protein fromHaemophilus influenzae. CRS1 is a novel group II intron splicing factor that was derived from adomain of ancient origin. Protein-dependent group II intron splicing provides a forum for exploringthe roles of proteins in facilitating RNA-catalyzed reactions. The maizenuclear gene crs1 is required for the splicing of the group II intron inthe chloroplast atpF gene. Here we report the molecular cloning of thecrs1 gene and an initial biochemical characterization of its gene product.Several observations support the notion that CRS1 is a bona fide group IIintron splicing factor. First, CRS1 is found in a ribonucleoproteincomplex in the chloroplast, and cofractionation data provide evidence thatthis complex includes atpF intron RNA. Second, CRS1 is highly basic andincludes a repeated domain with features suggestive of a novel RNA-bindingdomain. This domain is related to a conserved free-standing open readingframe of unknown function found in both the eubacteria and archaea. crs1is the founding member of a gene family in plants that was derived byduplication and divergence of this primitive gene. In addition to itspreviously established role in atpF intron splicing, new genetic dataimplicate crs1 in chloroplast translation. The chloroplast splicing andtranslation functions of crs1 may be mediated by the distinct proteinproducts of two crs1 mRNA forms that result from alternative splicing ofthe crs1 pre-mRNA.